I have helped many many people pass examinations which were required to progress in their careers, including bar exams, occupational certifications, and medical boards. Helping people pass these exams is very rewarding, because usually the tests have become obstacles to moving forward in their life — leaving them feeling frustrated and stuck, especially since they know the material and often do well in practice exam situations. Not only is there a lot of pressure coming from their own internal desire to pass, but sometimes there is also pressure from external sources such as family members… even if they are trying to be supportive. This can cause a great deal of unproductive stress for weeks and months leading up to an important test. The internal and external pressures and demands and memories of past failures are enough to cause a person to freeze up, be paralyzed with self-doubt, and find it difficult to concentrate. A stressed, exhausted, emotional mind does not perform at it’s best! Many people are surprised to discover that helping them approach an upcoming test in a more relaxed and productive mental attitude, has a positive effect on all aspects of their daily life. 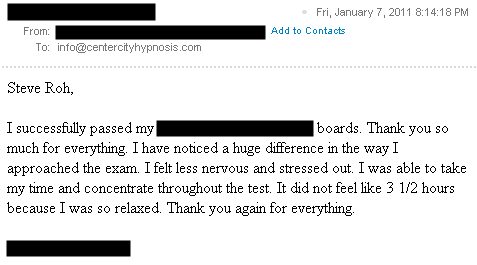 In addition to standardized written examinations, I have also helped people pass exams which involve being interviewed by a board of fellow professionals. Recently one of my clients was able to achieve first-place top score in a very competitive statewide examination, part of which required being grilled by people who needed to observe his ability to handle pressure and unexpected questions. Now he is ready and able to move onto the next level of his career. PS. As a hypnotist, it feels great to help clients succeed and I am happy to be a part of their successes, but I always remember that they are the ones who made success happen because of their own hard work and efforts! « Is Hypnosis a Magic Pill… or not?